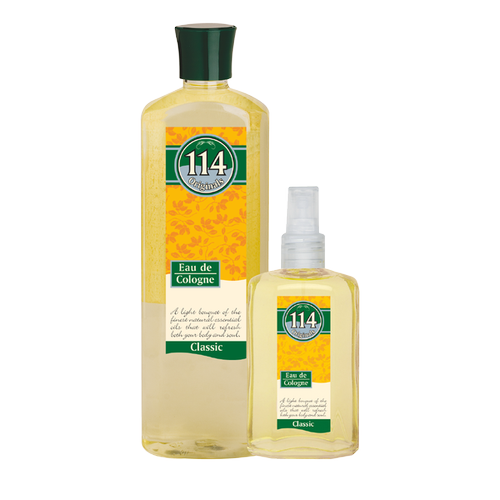 114 Eau de Cologne “Classic” made the reputation of our company. Created in 1928, it is a wonderful bouquet of natural essences with top notes of bergamot, verbena and orange blossom that will refresh your body and soothe your soul. One of our most recognized products in the market, this delightful Eau De Cologne has been a market leader since 1928. Formulated from the finest essential oils and carrying the notes of bergamot, orange blossom and verbena, this Eau de Cologne keeps you fresh all day and energizes both your body and soul. MAY CONTAIN: CI 42090, CI 19140, CI 20285.